By law, its illegal to wedge open a fire door within a building. 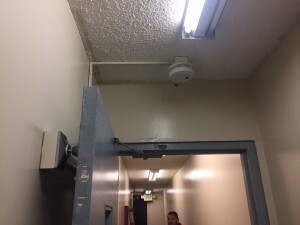 The reason being is that if a fire breaks out, a fire door is in place to burn for 1.5 hrs so the fire doesn’t immediately spread into the next corridor. That directly minimizes property damage potential in addition to being ultimately life-saving. 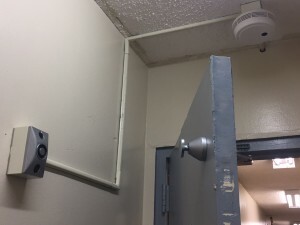 In many buildings we’ve come across, tenants seem to wedge fire doors open if there is no magnet and smoke detector setup to hold the door open. Most tenants will complain that there is no air flow, the doors are difficult to open, or any other excuses that come up. In buildings with situations like this, installing a magnetic with smoke detectors is the best solution. We install those systems professionally and have done many successful jobs to date. Its really very simple. Once the installed smoke detector is activated, the magnetic will release within 10 seconds, allowing the door to swing closed automatically. 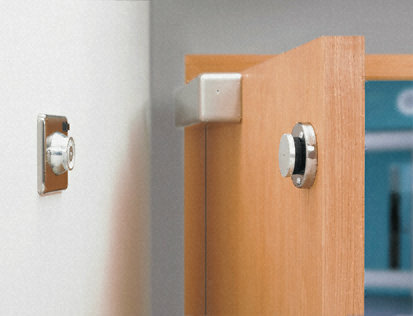 It also falls under the Reg 4 Test: Automatic Closing Assemblies, to ensure the doors properly close and latch.